Good news for mobile marketers: U.S. mobile ad spending far exceeded expectations and grew by 180 percent in the United States alone in 2012. The growth of mobile advertising is a timely development in light of today’s news about the publication of Mobile Marketing: An Hour a Day, co-authored by Rachel Pasqua (who works with me at iCrossing) and eMarketer’s Noah Elkin. Mobile Marketing: An Hour a Day gives CMOs and their teams a detailed guide for how to build brands with mobile marketing. The ethos of the book is this: mobile marketing is about the audience, not the device. The key to successful mobile marketing is creating connected moments throughout the entire purchase journey. The book covers every aspect of employing mobile marketing, such as location-based marketing via destinations like Foursquare and Yelp or managing a mobile commerce site. Hence, Mobile Marketer: An Hour a Day focuses on the importance of audience and strategy first, and devices second. 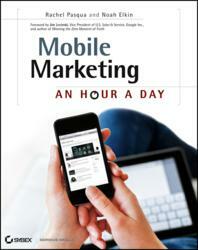 For example, the first two chapters discuss mapping the mobile opportunity and creating a mobile strategy. Subsequent chapters show how various aspects of mobile marketing, such as the development of mobile websites and apps, tie back to strategy. You can get a better sense of Rachel’s “audience first” thinking in a blog post she just published that introduces the book. Moreover, Rachel discusses the growth of mobile marketing more broadly in two recently published posts, Why 2012 Really Was the Year of Mobile and 8 Mobile Marketing Trends for 2013. How are you embracing mobile marketing in 2013? This entry was posted in Marketing and tagged David Deal, eMarketer, iCrossing, mobile, Mobile Marketing: An Hour a Day, Noah Elkin, Rachel Pasqua, Superhype. Bookmark the permalink.